The program is designed as a 5-6 year, year-round curriculum. In addition, SLHS offers a separate graduate program in speechlanguage pathology accredited by the Council on Academic Accreditation in Audiology and Speech-Language Pathology of the American Speech-Language-Hearing Association. It may be possible for a doctoral student to complete a CFY or obtain academic and clinical training concurrently with doctoral studies. However, access to clinical training is not automatic nor is it guaranteed. Initiation of clinical training requires the approval of the S-L Division faculty and the availability of openings in the clinical program. In the SDSU/UCSD program, students receive education in areas that are relatively new to the field of communication sciences and disorders. The program encourages applicants from a range of different backgrounds. Students are asked to concentrate in at least one of three tracks: child language (normal and abnormal), adult language (normal and abnormal), and/or multilingualism (including bilingualism in oral and signed languages, and crosslinguistic studies of language disorders). 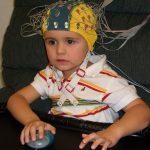 Students are exposed to a range of technologies, including experimental methods in the study of behavior, electrophysiology and functional brain imaging, and computational modeling. Upon admission to the program, the executive committee will assign each student a faculty adviser. The faculty adviser will help the student select a program of study during the first year. The faculty adviser, in conjunction with the doctoral program ‘coordinators, will help the student select a first laboratory rotation. Once the student has selected a major area of study (see below) the student will be reassigned an appropriate adviser. Students will be required to complete credits equivalent to one year’s full-time enrollment at each campus. The definition of residence must be in accord with the regulations of SDSU and UCSD. Students may be enrolled in courses at both institutions during any given semester/quarter. Students are required to have some experience in the acquisition of a second language. This may be satisfied through informal learning, immersion, or two or more years of formal coursework in a second language. Any recognized natural language will be acceptable to fulfill this requirement (including American Sign Language or other sign languages). Artificial languages, e.g., computer languages, will not satisfy this requirement. For students selecting the multilingualism concentration, proficiency must be demonstrated in English and at least one other language. The Adult Language concentrationis intended to provide intensive education in communicative disorders in adults. Students in this concentration will also develop expertise in the study of language processing in normal adults. The Child Language concentrationis intended to provide specialized education in childhood (birth to adolescence) communicative disorders. 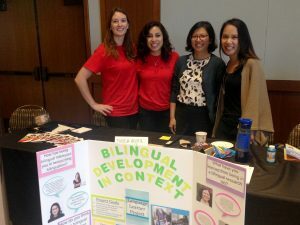 Students in this concentration will also achieve competence in developmental psycholinguistics emphasizing language acquisition in normally-developing children. The Multilingualism concentrationis intended to provide education in cross-linguistic, ethnographic, and other comparative studies of communicative disorders in children and/or adults, including those associated with bilingualism and second language acquisition (including acquisition of sign language in deaf individuals). Consult with adviser for approved elective courses. Other electives may be taken to satisfy this requirement with permission of the adviser. The five required electives must be approved by the student’s adviser and the doctoral program coordinators. Students may select additional electives with approval of the adviser. In order to obtain experience in different research methodologies, each student will be required to complete two laboratory rotations, each lasting a minimum of one semester or quarter. During each rotation, students will enroll in the associated laboratory course. The laboratory rotations must be approved by the student’s adviser and the doctoral program faculty member who supervised that laboratory. All students will be required to complete two research projects during their first two years of the program (first and second year projects). These projects are usually connected with the laboratory rotations and approved by the doctoral program faculty working in the laboratory. These projects will involve experiment design, data collection, analyses, preparation of a potentially publishable manuscript, and an oral presentation of the research findings at one of the laboratory seminars. Students will be encouraged to submit their projects for presentation at professional meetings and to submit them to an appropriate journal. It is expected that the student will gain experience in the chosen minor through at least one laboratory rotation and enrollment in applicable courses selected with adviser recommendation. The Behavioral Dynamics minoris intended for students who want to specialize in computer-controlled methods for the study of language and cognitive processing in real-time. The Neural Imaging minoris intended for students who want to complement behavioral studies with neuroanatomical and neurophysiological techniques, including event-related brain potentials and functional magnetic resonance imaging. The Neural Modeling minoris intended for students who are interested in the simulation of normal and abnormal language and cognition in artificial neural networks. Students who elect this minor will be required to take Cognitive Science 201 F or Computer Science and Engineering 258A as an elective. After successful completion of the first and second year projects, the student is eligible to take the qualifying examination. The qualifying examination consists of a written component which is to be in the form of a scholarly review of one or more issues related to the student’s chosen area of research and an oral component which will be a formal presentation of the paper to be presented at the annual fall doctoral colloquium or at a separate colloquium. Students will be encouraged to write their integrative paper in a form and quality which may be submitted to an appropriate journal. The teaching requirement may be satisfied under one of two options. Mode/1 requires that the doctoral student teach a full course and submit the course syllabus to the Executive Committee for review at the end of the semester/quarter. Model 2 requires that the doctoral student serve as a TA (SDSU). and/or TA (UCSD). for two courses. The student will develop a syllabus in an area related to one of these courses and present a master lecture to the Executive Committee and an invited audience on a topic in the syllabus chosen by the Executive Committee. Prior to developing a dissertation proposal, the student must have a dissertation committee. The committee members are recommended by the doctoral program coordinators with consent of the executive committee, and then appointed by the graduate deans of both campuses. The dissertation committee will consist of at least five members, including four from the doctoral program faculty groups (with at least two members from each campus). and one faculty member from outside the doctoral program faculty groups. The dissertation proposal will take the form of an NIH or NSF grant proposal. For model 1 dissertation (see below), the proposal will be based on completed research which become pilot studies for the grant proposal. The student may be encouraged to submit the grant proposal to support their future research, e.g. post doctoral studies, or a First Investigator Award. For model 2 dissertation, the proposal will become the basis for the dissertation research to be completed. The dissertation proposal must be approved by the student’s dissertation committee. A student will be recommended for advancement to candidacy after completing all requirements as described above, including the qualifying examination and the dissertation proposal. Students eligible for advancement to candidacy are recommended .to the Graduate Deans of both institutions. When approved by both institutions, students will be notified by the Graduate Studies office at UCSD. Model 1 dissertation– Students who have maintained continuity through their second year project, qualifying examination, and dissertation proposal, and who have successfully generated publishable research which has been submitted to respected journals, may use a minimum of three such interconnected manuscripts as their dissertation. The dissertation will contain an introduction and review of the literature which conceptually links the submitted studies, the studies themselves (exactly as they have been prepared for publication), and a conclusion which publish the results together in a broader theoretical framework. Model 2 dissertation– Students may choose to carry out a more traditional dissertation involving the appropriate written presentation of original research carried out by the student under the guidance of the student’s dissertation committee chair. The dissertation defense will be the same for both dissertation models and will consist of an oral presentation of the dissertation material to the doctoral committee and a publicly invited audience. 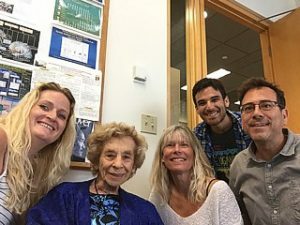 The Doctor of Philosophy degree in language and communicative disorders will be awarded jointly by the Regents of the University of California and the Trustees of The California State University in the names of both institutions.